BFSI sector accounted for over 60% share in the blockchain industry in 2017. The increasing use of the blockchain technology among the financial institutes in a variety of applications, ranging from cross-border payment and wallets to digital identity identification, is the primary factor augmenting the market growth. Furthermore, the technology also facilitates an omnichannel system for the customer and minimizes the time per transaction. North America held more than 50% stake in the blockchain market in 2017. The supportive government initiative & policy for driving the adoption of the blockchain technology among the public-sector companies is the major force supporting the market. Moreover, the presence of the major market players in the region also fosters the market growth. Whereas, Asia Pacific is predicted to grow at a CAGR of over 87% during the forecast period. The increasing investment in the blockchain market space from countries including China, India, and Switzerland, is driving the market growth. 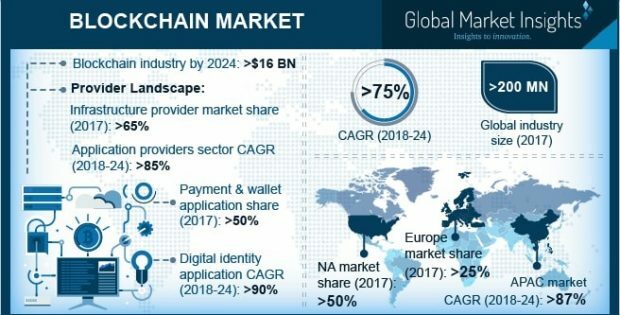 Blockchain Market is anticipated to exceed USD 16 billion mark by 2024 due to the growing investments in the blockchain market space. The venture capitalist and angel investors are investing in the blockchain based start-ups via private equity financing and ICOs. In 2017, an increase of over 50% in the venture capital investment was witnessed. This is encouraging the new players to work on the cutting-edge technology and explore new applications and business models. The growing adoption among the financial institutions is also one of the major factors augmenting the demand for the product market. The ability of the technology to increase the efficiency and reduce the cost of operations is also impacting the market. Moreover, the technology is also developing myriad growth opportunities and spurring further competition from the FinTech companies in the existing BFSI sector. The market is categorized into infrastructure providers, application providers, and operators. The infrastructure providers dominated the market space with more than 65% revenue in 2017. The growth of the market is credited to the growing demand for the core blockchain protocol to develop customized application and software. On the other hand, the application providers are anticipated to grow at a CAGR of more than 85% during the forecast timeline. The market is driven by the growing demand for the blockchain-based payment and documentation solutions. Payments and wallets are leading the application landscape with more than 50% stake in the blockchain market. The numerous benefits offered by the blockchain-based payment solutions such as transparency, speed, and cost-effectiveness are the major factors that foster the market growth. Moreover, there is an ability of the distributed ledger technology to eliminate the middlemen or requirement of the central authority for making the cross-border payments. Digital identity market is predicted to grow substantially during the forecast interval at a CAGR of more than 95%. The requirement for the reliable and secure international identification system and the growing risk of cyberattacks are the major forces driving the market. Smart contract market is also estimated to grow significantly at the growth rate of over 80% during the forecast timeline. The government sector is predicted to grow at a CAGR of over 85% during the forecast period. The ability of the blockchain to streamline the documentation process among the public-sector organization is the major factor augmenting the market growth. The growing adoption of the technology among the real-estate registration companies for creating smart contracts also drives the market demand. The market is characterized as highly competitive owing to the presence of both, multinational players and start-ups. The key vendors of the blockchain market are IBM, Microsoft, SAP, AWS, Ripple, R3, Alphapoint, Bitfury, Bacoor, Blocko, BitSE, Bloq, Blockstream, BTL Group, Coinbase, Chain, Digital Asset Holdings, Digiledge, and Earthport.